Paul from SVS fame has a query for you……..
Back when I started my blog I made a real effort to monitor the real world mpg of my Saab 9-3 TTiD 200bhp. Over the course of a year it had highs and lows, never really moving from 40 – 43 mpg with regular daily driving, that’s around 550 miles from a full tank. I can push it seriously hard one day and take it easy the next, sit at high speeds on the motorway or fly along country lanes, but the figures remain pretty constant. Over the past few months however, I’ve seen a real drop in these figures, down to 38 – 39 mpg, that’s between 450 – 500 miles per tank. This is an mpg trend that’s happened for the third Winter running, here in the UK we don’t get harsh Winters, we may get snow or extreme weather for a few days but nothing for a prolonged period, so I wonder what changes? If it’s abusing the Saab heated seats then I’m fully to blame, say no more. Below is a piece written by Steve Sowden from The County Gazette in Somerset, England. Alex is a good friend of mine and my co-founder of South West Saab. The snowy photo’s were taken on the 24th December which was the day Akex received his new TTiD. With an ever increasing focus on how we can do our bit to help protect the environment, eco-conscious Alex Rankin from Yeovil has invested in one of the cleanest, low carbon Saabs ever produced. 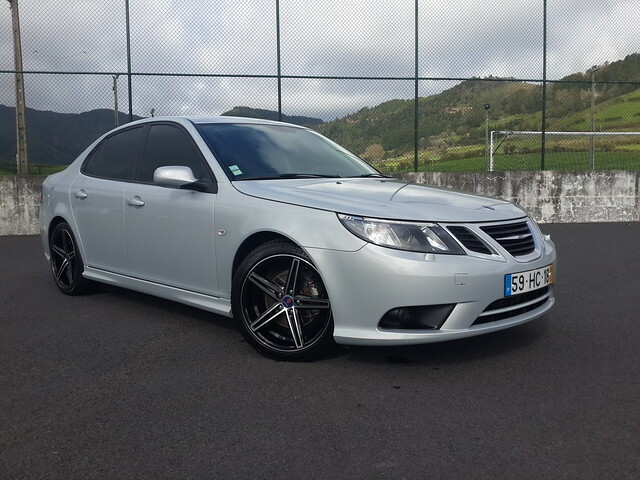 offered by the Saab 9-3 SportWagon. It seems Saab are receiving some very favourable consideration in the Swedish corporate fleet market. Swedish companies are beginning to trust Saab again and more people choose one of the company’s models. [This is] an important market for Saab as great company cars constitute [a large number] of sales. – We have pressure from our employees that Saab will be an eligible car [for company purchases/leases]. Saab has produced a pair of models [with] carbon dioxide emissions below 120 grams. And then there is another reason: it is a Swedish car maker, says Lennart Persson, head of car purchases in NCC. Bottom line – this refers to the Saab 9-3 TTiD Sport Sedan and with that, Saab are offering a range of cars that are popular in Sweden because they’ve been able to give the market something it wants: a sub-120g/km car with good space and power. Just wait until they get the SportCombi below that level. They’ll have to build bigger doors at the factory to ensure they can get them out quickly! This is something that the numbers have told us might be the case (sub-120g/km cars cost less to register, etc), but it’s great to hear it being confirmed. Our friends at Auto Motor and Sport have been speaking to Saab and there’s some indications there that some good news we’ve been expecting for a little while now is just over the horizon. Sales forecast was written down twice and Saab sold not more than 32 000 cars in 2010. But the year ended with a faster tempo and according to managing director Jan-Ake Jonsson, [there is] confidence [for] sales [in] 2011. Saab’s new start after the change of ownership in February was significantly slower than management had imagined. The original sales forecast of 60,000 cars were written down twice and finally ended up at only 32 000 cars. Although an improvement of 53 percent compared with 2009, but it was a particularly bleak year for the automotive industry as a whole and Saab in particular. Despite the problems is managing director Jan-Ake Jonsson happy with what you did to accomplish in 2010. Saab loaded bearings out at the shops and established new sales organizations in several countries. Important markets such as China, Russia and Australia in the starting blocks and they will contribute positively, as the launch of the new 9-5 sedan and the 9-4X. In addition, hope you capture the more important to company clients during the early years then also 9-3 SportCombi in an eco-rated version with a low emissions to 130-180 hp. 9-3 will also get a face lift to increase interest. The bit of particular interest there is the last few sentences, where it states a couple of things we’ve been expecting, but hadn’t heard much of from a Swedish source. The 9-3 SportCombi will achieve the same low-emissions status with TTiD engines as the 9-3 Sport Sedan, and will be available in three versions from 130-180hp. This is expected early in 2011. The 9-3 range will receive a facelift to carry it through to a replacement model in late 2012. It’s noted that those items aren’t direct quotes from people at Saab, but the author of the article is a man I know reasonably well, Pär Brandt, and I know he talks to the right people at Saab. He’s not one who’s given to idle speculation. Anyone who knows anything about the Swedish market will recognise the massive drawcard a 119g/km emissions SportCombi will provide for Saab. Sales have been up already on the strength of the Sport Sedan offering this much power with such little emissions. To have to configuration available in the Swede’s favoured body style, the SportCombi, is going to be a huge bonus. It’s nice to see Pär make use of an article penned by our newest contributor, Red J, as part of his column. Thanks to Tobias for the tip!